Draw a gentle slope from summer and autumn, and then serenely glide down it. 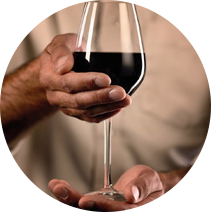 That is the program this month, with the promise of a delightfully gentle food and wine pairing. There’s little more comforting than golden buns of a light texture and an almost-sweet taste. This sets the tone and the filling follows the trend. The buns are spread with a generous helping of beetroot hummus which gently envelops the taste buds. Then comes the quinoa and butternut burger, crispy on the outside and tender on the inside, epitomizing the season’s vegetal notes. And, for the finishing touch: thin slices of firm goat’s cheese and a scattering of rocket leaves and blackberries to add a bit of punch on the palate. Accompany this vibrant autumnal delicacy with an A.O.C. 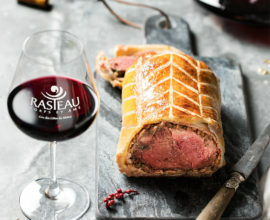 Rasteau red wine of a deep garnet colour. Its aromas of red berries ripened by the sun, both suave and fresh, become one with the flavours of this revisited burger. Its notes of jammy wild blackberry work in harmony with the juices of the burger that we have just bitten into. The spicy and peppery flavours of this wine play the same role as the rocket and cheese, bringing a delicate but strong note and finishing with an intelligent balance. Autumn opens it arms to us, let’s invite it onto our table! Place all the ingredients in a blender and mix until the consistency is creamy. Add more seasoning if desired and store in the fridge. Cook the quinoa in twice its volume of water. Drain and set aside. Chop the garlic and parsley. Roughly mash the chick peas with a fork. Fry the shallots gently in 4 tbsp of oil, then add the grated butternut and the garlic. Cook for around 10 minutes. At the end of the cooking time, add the chick peas and cumin. Leave to cool. In a large bowl, mix together the quinoa, the vegetable and chick pea mixture and the parsley and egg. Add the flour. Season with salt and pepper. Shape into 4 burgers with your hands, coat them in the chick pea flour, and leave them to cool in the fridge for 1 hour. In a hot pan, fry the burgers in the remaining oil, over a high heat, for 4 minutes on each side. Cover the burgers and keep them warm. Lightly toast the burger buns. Cut the goat’s cheese into thin slices. Spread the hummus onto the base bun of your burger. 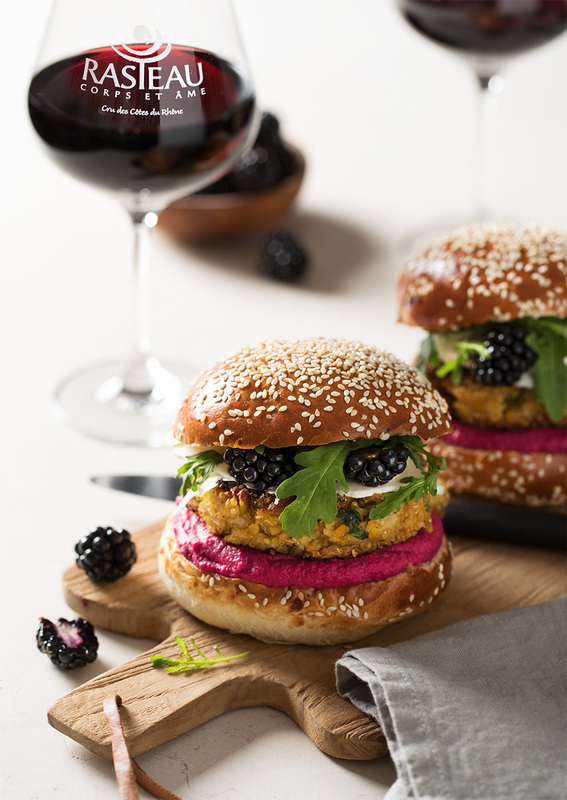 Place the veggie burger on top with some slices of cheese, a few rocket leaves and a couple of halved blackberries. Cover with the top bun and tuck in without delay. Tip: for the veggie burgers, you can add a little more flour or egg if necessary, if the preparation is too sticky or too dry. 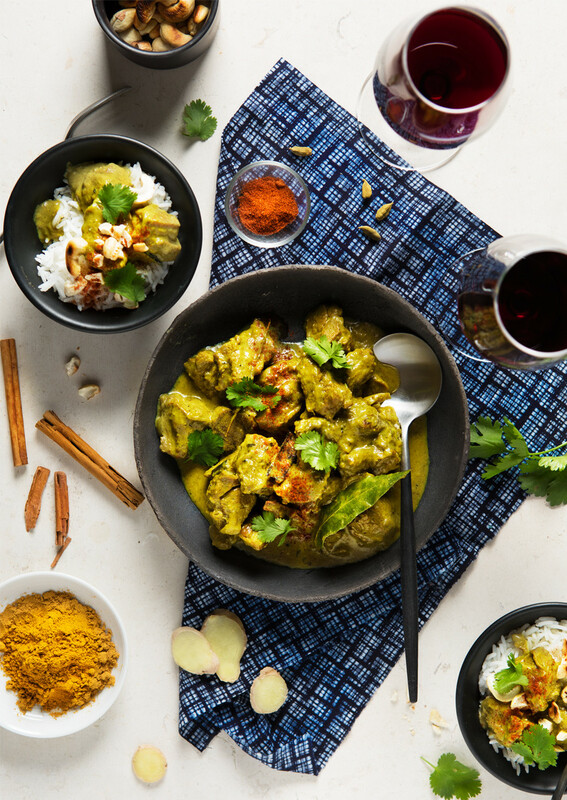 Discover all our food and wine pairing recipes! Photo credits: Anne Faubeau for C’est Ma Food. Its BBQ time! 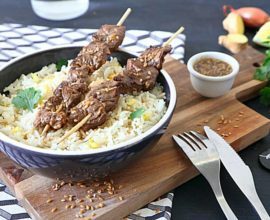 Beef kebabs and fragrant ginger rice, by Foodette! 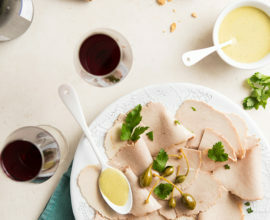 Vitello tonnato, Italy on a plate!